Braille is a medium which allows a non-sighted person to read text by touch, is also a method for writing tactile text. The braille code is physically presented as raised dots. usually arranged in cells of up to 6 dots. This is why braille writing devices have six main keys- each key controls a dot in the braille cell. In practice, most braille users do not employ grade 1 braille they use grade 2. Grade 2 is a shorter form which makes reading and writing braille much faster. It can take several months to learn to read and write in grade 2 code. A competent writer of braille has a speed advantage over the person who writes in conventional text, whether hand-written or typed, since braille is a faster recording medium than either of them. Writing Braille by hand is accomplished by means of a device called a slate that consists of two metal plates hinged together to permit a sheet of paper to be inserted between them. Some slates have a wooden base or guide board onto which the paper is clamped. The upper of the two metal plates, the guide plate, has cell-sized windows under each of these, in the lower plate, are six slight pits in the Braille dot pattern. A stylus is used to press the paper against the pits to form the raised dots. A person using Braille writes from right to left; when the sheet is turned over, the dots face upward and are read from left to right. Braille is also produced by special machines with six keys, one for each dot in the Braille cell. The first Braille writing machine, the Hall Braille writer, was invented in 1892 by Frank H. Hall, superintendent of the Illinois School for the Blind. A modified form of this device is still in use today, as are later, similar devices. 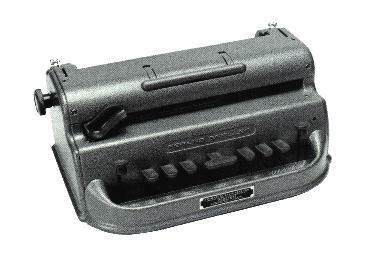 A recent innovation for producing Braille is electric embossing machines similar to electric typewriters. In addition to the literary Braille code, there are other codes utilizing the Braille cell but with other meanings assigned to each configuration. The Nemeth Code of Braille Mathematics and Scientific Notation (1965) provides for Braille representation of the many special symbols used in advanced mathematical and technical material. There are also special Braille codes or modifications for musical notation, shorthand, and, of course, many of the more common languages of the world. Braille was himself blinded at the age of three in an accident that occurred while he was playing with tools in his father's harness shop. An awl slipped and plunged into his eye. Sympathetic ophthalmia and blindness followed. Nevertheless, he became an excellent organist and cellist. Upon receiving a scholarship, he went in 1819 to Paris to attend the Institution Nationale des Jeunes Aveugles (National Institute for Blind Children), and from 1826 he taught there. When Louis Braille entered the school for the blind in Paris, in 1819, he learned of a system of tangible writing using dots, invented in 1819 by Captain Charles Barbier, a French army officer. It was called night writing and was intended for night-time battlefield communications. In 1824, when he was only 15 years old, Braille developed a six-dot "cell" system. He used Barbier's system as a starting point and cut its 12-dot configuration in half. The system was first published in 1829 a more complete elaboration appeared in 1837. Braille's system was immediately accepted and used by his fellow students, but wider acceptance was slow in coming. The system was not officially adopted by the school in Paris until 1854, two years after Braille's death. A universal Braille code for the English-speaking world was not adopted until 1932, when representatives from agencies for the blind in Great Britain and the United States met in London and agreed upon a system known as Standard English Braille, grade 2. In 1957 Anglo-American experts again met in London to further improve the system. For the last years of his life Braille was ill with tuberculosis. His remains, returned to his birthplace after his death, were in 1952 sent to Paris, to be buried in the Panthéon. Or To Top of The Page.